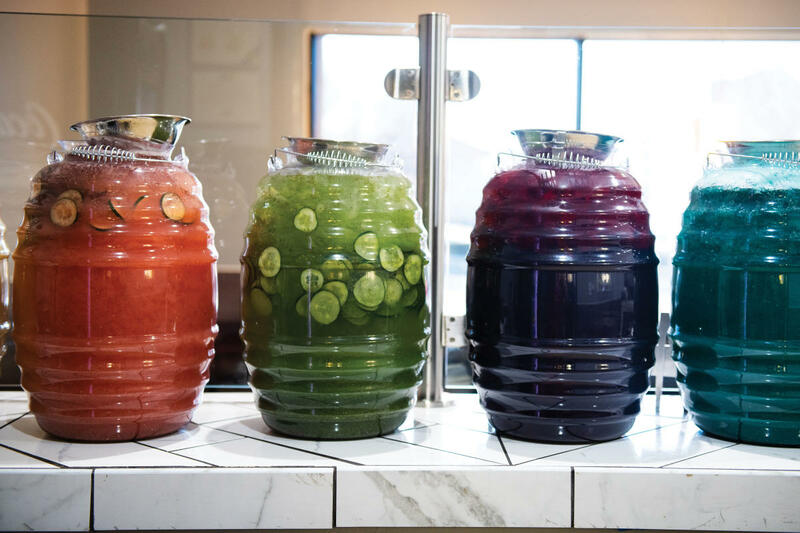 Above: Dive into a spectrum of aguas frescas colors and flavors. Photographs by Douglas Merriam. WHEN THE PETALS OF the flor de jamaica (hibiscus flower) begin to dry, they turn a deep crimson, the color of my favorite lipstick. The wine-tinted concentrate that comes from steeping them in hot water is just as rich. Add just a touch of sweetener and some ice and you’ll have a handsome drink, tart almost like cranberry, and better known as an agua fresca (“fresh water”). The flavors and colors abound, and change according to the season and the ingredients—fruits, vegetables, seeds, or grains that are lightly blended with sugar and sometimes lime. An agua de pepino (cucumber water) yields the same pale green that my great-grandmother painted her kitchen cabinets, and a flavor so refreshing it tastes like spring. There are other aguas, too: melón (cantaloupe), sandiá (watermelon), piña (pineapple), tamarindo (tamarind), and, of course, horchata, the sweetened rice drink that’s spiced with cinnamon. According to Mexican lore, the Mexica (Aztec) muddled the first aguas frescas from fruits gathered while paddling along the waterways of Tenochtitlán, now the bustling concrete monolith of Mexico City. They then added ice from the dormant volcanoes Popocatépetl and Iztaccíhuatl nearby. Over time, aguas frescas became especially popular among the street fare and home kitchens of Guatemala and Mexico, booming in the sugarcane state of Michoacán. By the 1940s, the agua fresca and its close cousin, the paleta, migrated into the U.S. in vendors’ carts along with other sweet and savory treats, and in time, entire business empires were built on cold fruit infusions. Those eventually turned into some of the most recognizable chains, including La Michoacana. Above: Melody, Hugo, Michelle, and Sergio Rios serve authentic aguas frescas. “We eat first with our sight,” says Michelle Ríos. 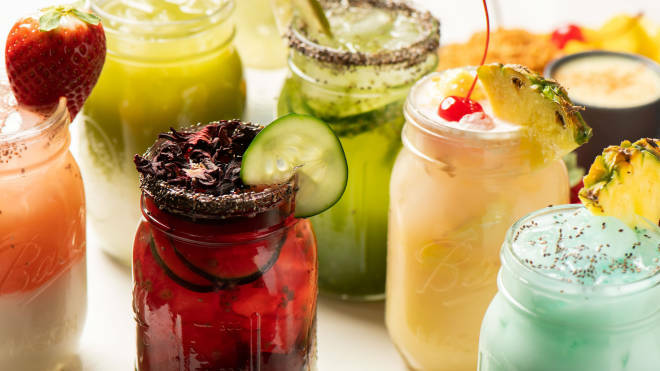 She believes that a major part of aguas frescas’ appeal is visual. The next reward comes with the first sip. 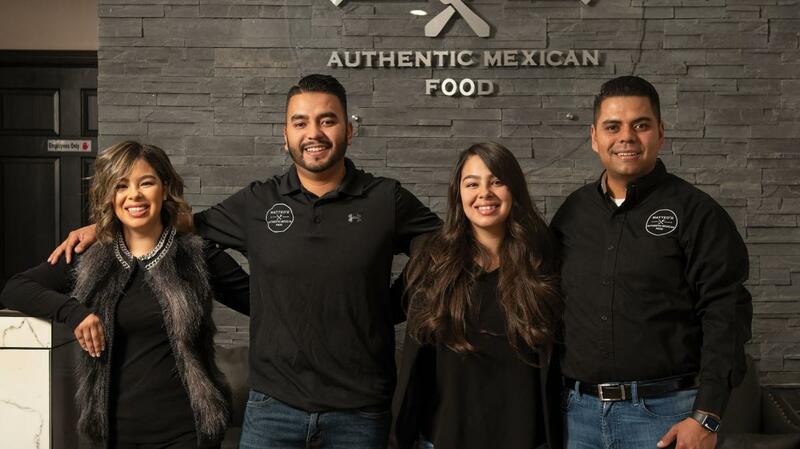 Michelle and her twin sister, Melody, both of Las Cruces, are the patronas who’ve divined the recipes behind the particular brand of aguas frescas they now sell at their family business, Matteo’s Authentic Mexican Food. It’s named after the youngest baby in the family, four-year-old Matteo. Matteo’s initially sprung from the twins’ love of made-from-scratch recipes, which transformed into a side hustle delivering food from their cars. Eventually Michelle and Melody, along with their husbands, Sergio and Hugo, who are also brothers, got their own food truck in April 2018. By the end of a year, the following that they garnered off of Las Cruces’ Main Street was enough to open a bona fide restaurant across from New Mexico State University. Everything on the menu was a hit. Looking back, Michelle says that her family always wanted to drink “something from their culture that was also handmade, just like fresh tortillas.” An ice-cold agua fresca also made Las Cruces’ summer heat bearable. In time, she got into the habit of asking whether the aguas frescas offered on other restaurants’ menus were made from scratch. The answer was almost always “No, son de polvo” (“No, they’re made of powder”). The tendency to industrialize nearly everything had literally turned aguas frescas into powder, Michelle lamented. So when the Ríoses opened their own business, they made it their priority to craft all of their aguas in-house, fresh from scratch, every day. “Not from powder,” she says sweetly. If you buy a cup filled with any of these offerings, Matteo’s will serve it from a barrel-shaped glass vitrolero, one of several arranged side by side. A row of them produces a luscious tropical color wheel. Michelle and Melody’s menu has all the classics, in addition to signature Ríos specialties, including the Blue Ocean, made by combining agua de piña with chia seeds and spirulina, a blue-green algae that is so topaz in color you may wonder, briefly, whether it’s artificial. “It’s not,” she says with assurance. There’s also an option for our keto-going friends, a sugar-free mojito-flavored agua fresca. Other glorious combinations include the Blue Frost: half horchata, half Blue Ocean. And the Pink Ombré: agua de jamaica with horchata. Michelle’s favorite is The Mix: part agua de jamaica, part cucumber-chia limeade. Her recommendation is to drink it with their carne asada french fries. Hear, hear. Soak rice overnight (or 8–10 hours) with cinnamon sticks. Afterward, discard the cinnamon sticks and pour rice and water into a blender. Blend for three to five minutes or until fully incorporated. Strain mixture through a fine sieve, then add evaporated milk, vanilla, and sugar. Mix thoroughly. Pour over ice and garnish with cinnamon. ¡Disfruta!